Forget MOOCs--Your Biggest Problem is Bandwidth! New applications, devices, and modes of learning are responsible for an ever-escalating bandwidth demand that colleges and universities can't afford to ignore. Social networking, video streaming, connected learning, flipped classrooms, web-based services--they all contribute to amazing forms of education innovation. 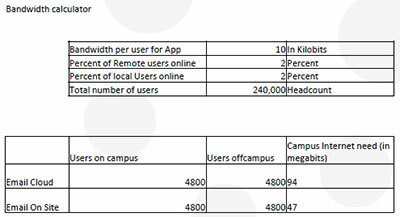 At the same time, with each new use of technology on campus there's a corresponding leap in bandwidth demand. Yet few institutions seem to acknowledge just how much pressure the introduction of new applications, new devices, or new modes of learning--and the resulting escalation of bandwidth needs--place on their IT infrastructures and budgets. Jorge Mata, CIO for the Los Angeles Community College District, may be the exception. His district has nine colleges spread across the LA region and serving about 142,000 full-time equivalent students. He believes many IT leaders are ignoring the voracious appetite for bandwidth at their own peril. To illustrate the problem his district faces, Mata cites a statistic: LACCD bandwidth had to grow by a factor of 2,000 in the last 15 years to keep up with demand. And the need for capacity is actually accelerating. Whereas a shared T1 with 1.5Mb of capacity served the district in 1995, by 2000 the colleges required a shared DS3 fiber optic backbone with 45Mb of capacity; by 2010 the appetite required a shared Gigabit Ethernet fiber connection. That's akin to going from 1.5 mph, Mata proposes, to 45 mph, and from there to 1,000 mph. The next leap will be to 10,000 mph, when the district hopes to have a shared 132Gb backbone in place. Jorge Mata presented the session "Bandwidth and the Cycle of Denial" at CT Forum this past April in San Diego. To view the archived presentation, visit the Sonic Foundry media site. Mata defines bandwidth not just as how much data can be sent or received in a second, but as "How good will my Netflix movie look? How quickly will my e-mail download? How frustrated will I get as I try to learn?" He likens bandwidth to clogged LA freeways: It's not just knowing how many lanes there are on the route you're taking. "You've got to think about how quickly you can get data from one place to another." For five years the district has been in the midst of a building jag--nearly $6 billion in new construction--all requiring the transfer of large digital engineering and architectural documents on the LACCD network. At some point, internet connectivity became a major bottleneck for all users on the campuses. "The engineers and architects had to do their jobs," he says. "At the same time our core mission was going on. We were looking at traffic that was important. But how do you prioritize that?" Although the district's service provider offered up more bandwidth as a quick solution, it's never really as simple as just saying yes, Mata explains. "We had to have end-to-end capability to accept that bandwidth. A lot of organizations don't have the security systems to handle that bigger pipe. Their firewalls may be unable to utilize all that bandwidth. We had to do analysis of that to make sure that we were ready." They were ready, and the increase took place. Immediately, the extra capacity was being used. It wasn't as if usage "crept up to 200Mb," Mata notes. It was at 45Mb one day and the next it was at 100Mb. Users were, he says, "starving for bandwidth." IT was able to apportion capacity: "100Mb for our construction folks, and 100Mb for education, and some reserved for our backend business." Although that was a fairly straightforward endeavor, doling out bandwidth can pose problems. "There's a point where the complexity of managing and micro-managing the bandwidth overwhelms any of the value." It's like taking a pizza, he says, and slicing it into "a thousand little pieces. There's a point where you need another pizza--or you need a whole trunkful." The equivalent to buying a trunkful of pizzas is adding new backbone connections, a proposition that can be "extremely expensive," he notes. "You can't say, 'OK, we ran out of bandwidth. Add a quarter of a million dollars to our budget right now.'" The new construction activity has exacerbated bandwidth utilization by deploying what Mata refers to as a "sea of sensors," all connected "on the wire": building and inventory automation, security and access control, and power, among other "smart" installations. "We're building 'smart' everything. What that means is it uses more bandwidth." But There's Always the "Cloud"
Anybody who suggests the cloud as "salvation" isn't thinking through the ramifications, Mata suggests. Even though the use of cloud services shifts applications to somebody else's servers and simplifies deployment, licensing, scalability, and upgrades, it "accelerates consumption," he points out. "I implement a cloud service. All of a sudden, thousands of students want to access it from my college. Was I ready for that?" As an example, Mata points to LACCD's adoption of Office 365 Education, Microsoft's web-based productivity and communication applications. The district will set up 480,000 student cloud e-mail accounts and allocate 17 gigabytes of storage per student, totaling about 8.2 petabytes of total storage. The implementation of Office 365 also includes activating Lync's video collaboration functionality. "If you thought you were using a lot of bandwidth, wait until the student use kicks in," he says. "We think of video as, I make a call and then I hang up. That's not the way they see it... They sit in their homes, and they just turn on the video. They're working and they just watch each other. Sometimes they don't talk; they just like being near each other. They're consuming on and on and on." On top of that, he notes, while cloud usage may free up IT time, those staffing resources now are available to undertake new projects that will inevitably lead to additional bandwidth usage. "We're not going to be able to ignore the problems," he says. While Mata observes that some people may consider his views "a little over the top," he's a practical CIO. "We want to be good stewards of bandwidth," he declares. To manage capacity, he offers five areas to pay attention to. LACCD's IT managers impose multiple forms of bandwidth control technology: caching, quality of service, de-duplication, virtualization, RSVP (a resource reservation protocol), rate limiting, and user authentication. Each of those is used to reduce how much traffic actually has to be carried back and forth on the network. Authentication especially is a source of debate among colleges and universities. Should IT organizations require users to gain formal access to internet resources or follow a laissez faire model and allow internet openness to reign on campus? Mata prefers tighter control for LACCD. "Different people have different opinions. I do understand why people confuse guest access with no security with open access," he muses. "My concern is this: We have such a great need for students and for our business and back end support. If we have a limited resource, how can I really justify someone that may not have anything to do with our organization using that resource?" That said, he adds that the colleges have the capability of setting up "walled gardens" to give people unauthenticated access to .edu or .gov sites. Mata uses fairly simple spreadsheet calculations to estimate how much bandwidth new initiatives might require. For example, the district is currently using a cloud-based videoconferencing solution. "We know how many seats we have. We know how many concurrent users we have. We can calculate and say, 'Well, if all those seats are used in one location, this is what it will do with bandwidth--it'll consume 50Mb,'" says Mata. When people start talking about expanding that video solution to all of the district's classrooms, Mata can start asking relevant questions: "How many students at any given moment are in a class? What percentage of faculty are interested in using this?" Armed with that data, he can open up his calculator and provide numbers. "Your numbers are only as good as your assumptions, but you're not going in blind," he notes. Mata acknowledges that the calculator can also add a measure of restraint to campus ambitions. "People might say, 'We have a great idea,' and I say, 'OK, let's calculate that and see. You only have 85Mb. If your idea is successful, this is going to cost you more than your budget to operate that application.'" That forces people to reconsider how a specific solution is deployed or how quickly it's deployed, or it might encourage people to wait for newer technology that will have less impact on bandwidth usage. Mata recommends scouring your institution's strategic and technology plans and "reading" between the lines. For instance, if there's an initiative planned to digitize all of the campus's paperwork and store it in a private cloud, suddenly, as people access those digital documents, there will be more traffic "being squeezed into that one lane." That happened at LACCD when the district undertook digitization of all of its building and floor plans to reside in a master repository. Shuttling documents among campuses made a dent in bandwidth capacity. On a broader horizon, strategic considerations might require a massive increase in the number of new freshmen entering the college over the next decade. And their behaviors might be different. Today's students, Mata notes, are multitasking and collaborative; they're constantly connected and device-rich; they're highly visual and experiential; they're action- and just-in-time-oriented. All of those considerations call for far-reaching plans to ensure sufficient internet capacity. For several years Mata has been promoting the idea of a project he calls "ConnectLACCD," as a way to link all of the colleges with a high-speed fiber optic network. This would increase network capacity and enable sharing of resources across the entire organization and serve, he says, as a "50-year solution." The backbone would be developed to deliver a minimum of 120Gb of bandwidth, an amount that could go up by a factor of 10 with "existing technology." Mata hopes to see the LACCD Board of Trustees sign a memorandum of understanding with a currently unnamed "public entity" that would provide at least some of the right-of-way needed to install that fiber, and that would also benefit from its use. "I think it's going to be a very good investment in the long range," Mata says. Once development begins, he's hoping to get the first segment "lit up" in 18 months. "The nice thing about this project, every little piece that gets turned on immediately gives capability to the organization. It's not like you have to wait until the whole thing is in. Each section adds more capability because it links more of us together." Mata's vision doesn't stop with a new inter-college backbone; he's also working on a scheme to add broadband wireless to each location to blanket an entire site. "We recognize that a lot of the bandwidth will be used wirelessly," he explains. "While the fiber gets a high amount of bandwidth to our colleges, we envision deploying broadband wireless at each location to augment our WiFi." Although that part of the planning is still sketchy, Mata says LACCD could take advantage of new technologies such as white space wireless, wireless broadband, or a private LTE network. "There would be a couple of large antennas to cover each college," he explains. "The idea is that we authenticate our students and give them options. They could have their cell phones, laptops, or tablets connected. Our facilities folks would be connected at all times. But we're not being eaten alive by telecommunications charges." Users would self-select when they're on campus, depending on what their mobile device could accommodate. "We're not going to force any student to upgrade their devices," Mata states. "We'll still provide that WiFi in the classroom. But they would see it on their devices if they have a newer capability." In the meantime, this self-described "compulsive guy with bandwidth" continues keeping people informed about the hidden impact of the technology decisions they make. Mata maintains a list of bookmarks to all of the web usage data for each of the colleges. "I open all the bookmarks and tap through them looking for trends. I have discussions with the college IT managers to decipher what's happening. I look at our board agendas and the contracts we're working on. It's part science, part art, part politics."